Spring is getting into full swing here in the South East and the time for indulging in copious bowls of nettle soup is upon us once more. Each year I end up with a new favourite variation on this time honoured classic of wild food cuisine and this year I’ve managed the impossible. I’ve come up with a recipe that my husband not only tolerates, but actually enjoys too. This is such a quick and simple soup but the texture and flavours make it feel both nourishing and fulfilling. Begin by lightly frying the onion and garlic in the olive oil until softened but not brown. Add the stock, cannellini beans (pre-cooked) and broccoli to the pan and cook until broccoli is tender. Add the nettle tops and a squeeze of lemon and cook for a few minutes until the nettles are wilted and soft. Add seasoning to taste and blend to a thick and creamy consistency. Garnish with a drizzle of wild garlic oil and, if available, some freshly chopped wild garlic leaves and violet flowers. 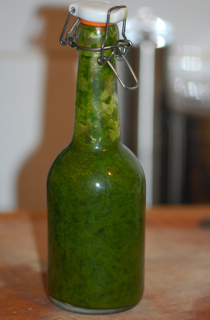 To make the wild garlic oil you simply lightly pack your blender with freshly picked wild garlic leaves and add somewhere in the region of 250ml virgin olive oil. Blend until you have an almost smooth vibrant green oil. This will last a couple of weeks in the fridge and can be added to soups, salad dressings or smeared on crackers. I always add it at the end though as wild garlic looses much of its flavour when cooked. 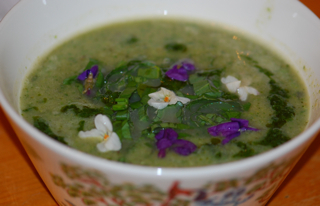 You can read my last year’s nettle soup recipes here and my recipe for wild garlic pesto here. I hope those of you in the Northern hemisphere are enjoying your spring bounties too. Lucinda, such a beautiful feast for the eyes. I love the finishing touches. I am tempted to try this…….a little uncertain with my allergy but perhaps I will give it a go. I love the way you use mother earths gifts….it is a delight to visit here. Also can’t wait to try the wild garlic oil! In a way it’s nice to be so behind you with the coming of spring, because you give me so many good things to look forward to! Can you use dried nettles for this? If so how much? Dried nettle wouldn’t really work as a replacement for the fresh but you could make it with spinach or another green instead and add a strong infusion made from dried nettles.